Nestled amongst the grand bluffs of the Mississippi River in Lake City, The Jewel Golf Club offers an unsurpassed golf experience. 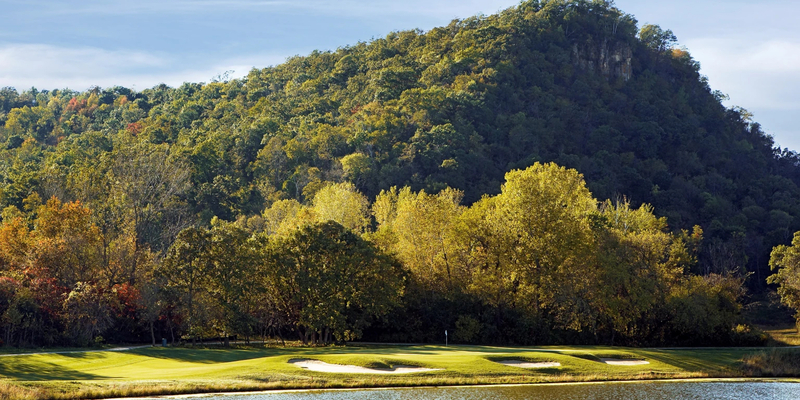 Designed by three time U.S. Open Winner, Hale Irwin, The Jewel Golf Club winds throughout 800 acres of the river valley. Routed through a variety of terrain, the course was designed with five sets of tee boxes in order to accommodate golfers of any ability level. With Hale's commitment to excellence and careful balance between aesthetics and playability, The Jewel is sure to provide an enjoyable and memorable experience for all of our guests. Please call 800-738-7714 for current rates. Call 800-738-7714 for rates and tee times. As history unfolds, the story begins to reveal itself...A world class golf club in an ideal setting. Imagine yourself as part of a fun friendly club committed to making your every visit enjoyable and memorable. Watch the sun set with new friends over dinner, take part in member only events, and most importantly enjoy a round of golf on a world class golf course. The Jewel Golf Club is a semi private golf club. 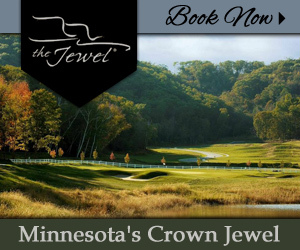 If you are looking for a fun and friendly golf community located in the most beautiful part of Minnesota, we invite you to explore the different levels of membership at The Jewel. Contact The Club at the Jewel at 800-738-7714 for more information and details on holding a golf outing at the course. Thank you for your interest in holding your next event at The Jewel Golf Club. The Jewel is a beautiful location for your special moment whether it be a wedding, business meeting, anniversary party or any other social gathering. We pride ourselves in making sure your event goes perfectly from the delicious cuisine and friendly and helpful staff to your own personal event coordinator to help you through every step of the way. You can view The Jewel Catering Menu from the link below. If you don't see something in the Catering Menu that you would like to have as a food option, please let us know. We would be happy to get pricing on those items for you. Contact The Club at the Jewel at 800-738-7714. Contact The Club at the Jewel at 800-738-7714 for onsite or nearby dining options. This Jewel is a Gem! This profile was last updated on 09/21/2015 and has been viewed 12,891 times.